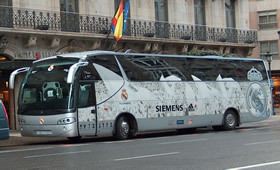 28.11.2010 »» Real Madrid bus got stoned in Barcelona"
Real Madrid's autobus was stoned earlier today in Barcelona, one day before the big clash between the spanish giants Barcelona and Real Madrid. One window got broken, near Raul Albiol e Arbeloa, who didn't suffer any physical injuries. Even after those incidents, Real Madrid counted with an huge support when it arrived "El Prat" airport. Around 2000 supporters were there to receive their Mourinho's team. Near the hotel, another 400 "madridistas" were waiting, but accompanied by 100 Barcelona fans. It was then that one of windows got broken, as result of a thrown stone.